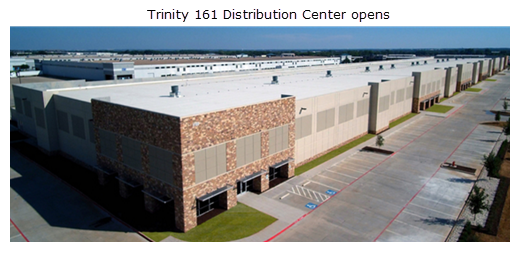 ​​​GRAND PRAIRIE – Trinity 161 Distribution Center​, 3100 North Hwy. 161,​​ is completed. The property sits at the intersection of Trinity Blvd. and SH 161. The new distribution center features 266,000 sf of spec warehouse space along SH 161. The building is constructed with tilt-up construction, with tan coating and decorative reveals. It's designed for smaller tenants, 20K to 60K SF, as well as the larger users. With a depth of 210 feet, the building is just right for small and large users. ​Check ​out DFW Industrial Research for updated quarterly data.